Will Masahiro Tanaka be staying in Japan or coming to the majors? In the saga of Japanese pitching sensation Masahiro Tanaka, only two things are certain. One is that the uncertainty surrounding his availability to major-league clubs has created an ongoing disruption to the free-agent market, now seven weeks after the final out of the World Series. The other is that a resolution, one way or the other, finally appears near. 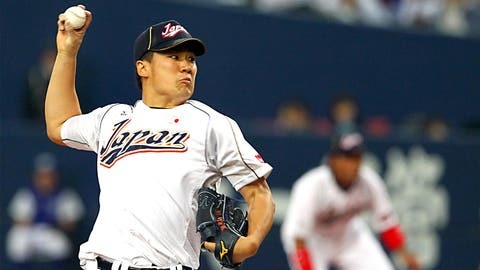 The Rakuten Eagles â Tanakaâs Japanese club â are "still undecided" about whether to post him to Major League Baseball clubs, according to the Japanese news agency Sponichi, in a report translated through the comprehensive Japanese baseball news aggregator Yakyubaka.com. But Yakyubaka also translated information from another Japanese news agency, Sports Hochi, saying Rakuten could offer Tanaka the equivalent of $7.68 million (U.S.) to remain in Japan. That would make him the highest-paid pitcher in Nippon Professional Baseball history, according to Sports Hochi. One MLB general manager who spoke on the condition of anonymity told FOX Sports 1 MLB Insider Ken Rosenthal that he was skeptical of the suggestion Rakuten plans to keep Tanaka. "Not sure I buy it," the GM said. Meanwhile, Tokyo Sports reported that the Eagles received a "self-introductory e-mail from Scott Boras," according to Yakyubaka, indicating that perhaps the American super-agent is poised to represent Tanaka if he makes the jump to MLB. Boras declined to comment about that report when contacted by FOX Sports 1. Tanaka, 25, is coming off a career year in which he went 24-0 with a 1.27 ERA in the Japanese Pacific League. Rakuten’s reluctance to make him available could be linked to the recent change in posting regulations between MLB and NPB. The old posting system functioned as a blind auction. The new rules effectively place a flat tariff on the value of a Japanese player’s contract; in the case of Tanaka, who is viewed as an elite pitcher, that price would be set at the maximum of $20 million. This system favors large-market teams such as the New York Yankees and Los Angeles Dodgers, both of whom are expected to be involved if Tanaka becomes available. The Texas Rangers and Arizona Diamondbacks also are expected to pursue him. The delay in Tanaka’s entry to the free-agent market â if it happens at all â has frustrated the MLB Players Association. Union officials and player agents are concerned about the impact of the Tanaka uncertainty on unsigned free agents such as Ervin Santana, Ubaldo Jimenez and Matt Garza. Teams have been reluctant to offer them contracts, in an effort to conserve their money for the prospect of bidding on Tanaka. If Tanakaâs availability had been resolved, one way or the other, Santana, Jimenez and Garza by now might have signed new contracts worth tens of millions of dollars. Instead, like many others in the baseball industry, they are waiting on Tanaka.